The experience of our Brothers of Atlas sheds light on our sharing in Mary’s role as mother of all the living. Now this may seem a little odd – Are we as monks really called to share in Mary’s mission of being a mother to all the living? God wants us to help bring forth others to life? How can we be mothers? Our brothers reveal this in at least three ways. First of all, there is their witness to stability. How important is it for a child to know that his mother can be relied on; that she will be there in time of need? That is what our brothers of Atlas did. They could have fled Algeria, leaving behind their beloved Muslim neighbors and more vulnerable to the violence all around. But they chose otherwise. When they asked their bishop for advice, he had exhorted them: “Constancy,” and the brothers took his word to heart. Constancy – in the Latin means to stand with. Their stability was their witness, “not crying out, not making their voice heard in the street”, but standing with their neighbors like Mary did at the cross. God planted the gift of stability in Mary’s motherly heart, enabling her to stand with her son, and our brothers shared in this gift. Our brothers were like mothers in another way. The emotional and physical bond of mothers with their children must eventually give way to a holy detachment. The children must be given freedom to mature, freedom to respond to God in their own way. Yet a mother cannot abdicate her responsibility. She must remain true to herself and true to the other. That is what our brothers did in the midst of their Muslim neighbors. They were quietly present, listening with respect, ready to learn. They matured in their own monastic vocation through their encounters with the people of the Quran. The greatest gift a mother can give may be respect for the freedom of the other, and that is what our Brothers did. Finally, there is the simple reality of love. Our brothers showed their love through their community life, in their communion with the local church, and in their steadfast commitment to their Muslim neighbors. They loved them to the end. Dom Christian in his Testamentsaid “…I would like my community, my Church and my family to remember that my life was GIVEN to God and to this country.” Love is the greatest “praise of the glory of his grace” which can be offered by a mother, or by monks, or by anyone else chosen by God to be conformed to the image of his Son. This is the greatest witness of our brothers of Atlas, and they have handed it on to us. Brothers and sisters, we are celebrating two great events of salvation history. We were chosen before the foundation of the world to share in the holiness and purity of Our Lady, and to allow this grace to pass through us to others: in stability, in freedom, and in love. Today let us remain with our brothers of Atlas under the mantle of Our Lady, ready to welcome all those whom God entrusts to our care. Madonna and Child with Saints, Giovanni Bellini (Italian, Venice, active by 1459–died 1516 Venice) and Workshop, Tempera and oil on wood, 38 1/4 x 60 1/2 in. The Metropolitan Museum of Art. Used with permission. 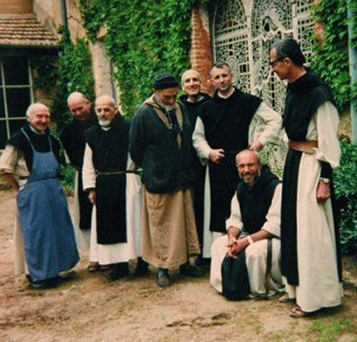 In May of 1996 seven of our Cistercian brothers of Tibhirine in Algeria were found dead. These monks were kidnapped from their monastery and beheaded by a group of Islamic terrorists trained by the al-Qaida network. Caught in the conflict between the Algerian government and the extremist Armed Islamic Group, these monks chose to remain at their monastery amid threats from extremist elements and face death in solidarity with the Muslim neighbors whom they loved. Our Trappist brothers were among the 19martyrs of Algeria beatified on 8December this year in Oran, Algeria. Pregnant Muslim women from the village adjacent to the monastery would often come to pray before the statue of Our Lady in the garden for safe deliveries. Muslims honor Mary as mother of Jesus the Prophet. We pray to her for an end to all terrorism, for peace, understanding and mutual respect between all Christians and Muslims. May these martyrs teach us to be models of Christian friendship, encounter and dialogue, and may their example help us build a world of peace.